Please refer to our stock # 8779 when inquiring. English Asthetic Period Earthenware Tea Cup and Saucer by Copeland, c. 1875. Japanesque pattern. No chips, cracks or restorations. 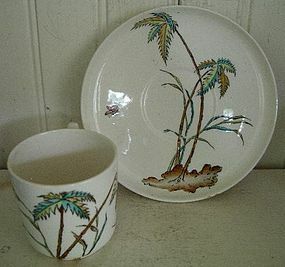 Pattern #D. 9875 marked on cup and saucer. Saucer marked with impressed COPELAND mark. Cup, 2 1/8 inches high. Saucer, 4 3/4 inches in diameter.